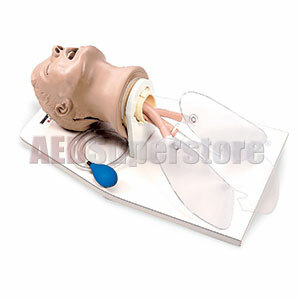 Life/form® Airway Larry is a great airway management trainer for introductory as well as advanced students. Ideal for testing purposes and Combitube practice. When pressure is applied to the cricoid cartilage, the position of the trachea changes and the esophagus closes, which allows realistic practice of the Sellick maneuver. It is also great for practicing the "jaw thrust" technique. Includes training stand to mount head, pump spray lubricant, and hard carry case. Three-year warranty. Shipping weight, 34 lbs.